Kate turned to the Man in Black for inspiration on her latest Large River Music release Damn Sure Blue. Two of the songs from this soulful collection stem directly from Johnny Cash’s prolific catalog—the folk classic “The Ballad of Ira Hayes” and his self- penned “Forty Shades of Green.” Produced by Will Kimbrough at Kimbrough Super Service with additional recording by Robert Lucas at Barefoot Jerry’s Cinderella Sound Studio in Nashville, Damn Sure Blue breathes with Americana soul and features a cast of stellar musicians including Will Kimbrough (guitars, bass, mandolin, banjo, mandola, keyboards, and harmony vocals), Kevin Gordon (guitars and harmony vocals), Dave Jacques (upright bass), Bryan Owings (drums and percussion), Phil Madeira (accordion), Chris Carmichael (violin, viola, and cello), Kate Campbell (piano and acoustic guitar), and album artwork by outsider artist Miz Thang. © 2018 Large River Music (BMI) / Will Kimbrough Music (BMI) Administered by Bluewater Music</p? Kate Campbell… A soundscape built on the three cornerstones, country, blues and folk… A collection of intelligent thoughts on the big US social issues… A super cast of musicians…Her voice always carries a strength, an emotional power, an irresistible charm…Her vocal signature is always a highlight… Excellent album! 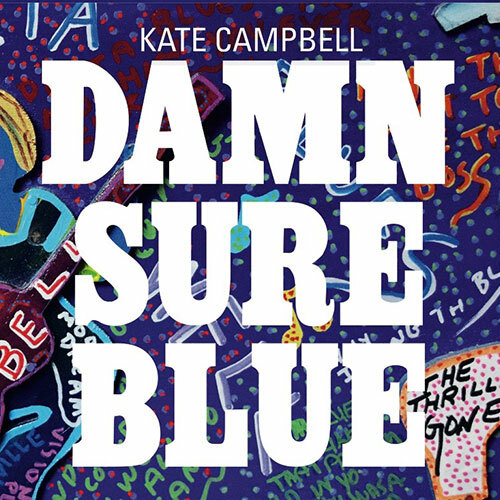 KATE CAMPBELL/Damn Sure Blue: Taking it back to when country and folk were loaded with meat, blood and grit, Campbell’s take on modern times was recorded at the oldest indie studio in Nashville with some Americana pros that feel her views intimately as well. Hard hitting stuff that doesn’t make you want to gargle with razor blades when it’s over, this on the mark throughout. A real ear opener, this set really tells it like it is. The first time a Kate Campbell CD landed in my inbox, in 2001, it stayed there until a convincing publicist called weeks later to follow up. Leaving the office I grabbed the hymns-plus-original-songs CD, Wandering Strange, and played it in my car. The moving lyrics and Kate’s mellow honest voice had me driving in circles on the way home to hear more. Shortly thereafter I met Kate on the steps of Birmingham’s 16th Street Baptist Church — where a 1963 bombing by white supremacist terrorists killed four precious black girls and inspired one of the songs on that earlier album. After we visited the Civil Rights Institute across the street I interviewed Kate for a feature story. Since then I have enjoyed Kate’s music through recordings and in concerts, including her singing at the 35th anniversary celebration of our publication a few years ago. Now when a new CD of hers arrives it quickly makes its way into my ears and heart. Damn Sure Blue (available at katecampbell.com) is Kate’s thoughtful musical response to the sad reality of resurfacing and politically emboldened white nationalism that has many of us wondering what has happened to the dream of living in racial harmony and equality. This CD contains five of Kate’s original songs and a couple where she turns to Johnny Cash for inspiration — including his justice ballad about Native American/military hero Ira Hayes. This new CD, however, is rooted in Kate’s melodious righteous anger over remaining if not resurgent injustice and inequality. Yet her music expresses a loss of patience, but not hope. Much of the fear-driven racial insensitivity and ethnic-based hostility in America today is advanced within and by an evangelical church culture — something this singing/songwriting preacher’s kid surely knows. Hence the disappointment and sadness many of us share. Kate doesn’t leave her listeners in the dark. Order is important. Kate’s begins the CD with the honest confession of being “damn sure blue” about the social climate in America today. Yet she ends with a blessing of hope. “Peace, perfect peace,” is a moving benediction mined from an old album by banjo-playing Grand Ole Opry star David “Stringbean” Akeman who was tragically murdered along with his wife in 1973. Damn Sure Blue allows for expressing our frustrations and disappointments that come from social and spiritual failures — but reminds us to not give up hope or abdicate our rightful places in the journey. Yes, it is, Kate. And, yes, we are.